The menu is a bit overwhelming. Ok, I won’t like, it’s a lot overwhelming, but that didn’t matter. Our server walked us through the whole menu. She explained things, gave us suggestions and answered all our questions, and trust me, we had questions. We decided to order dishes that we could share, as she had suggested. We had a safe item (chicken) and we had something she told us we shouldn’t miss, since it was a special, and that was the grilled octopus. Plus a few things in between. The first thing to come out was the Prahok Katee. 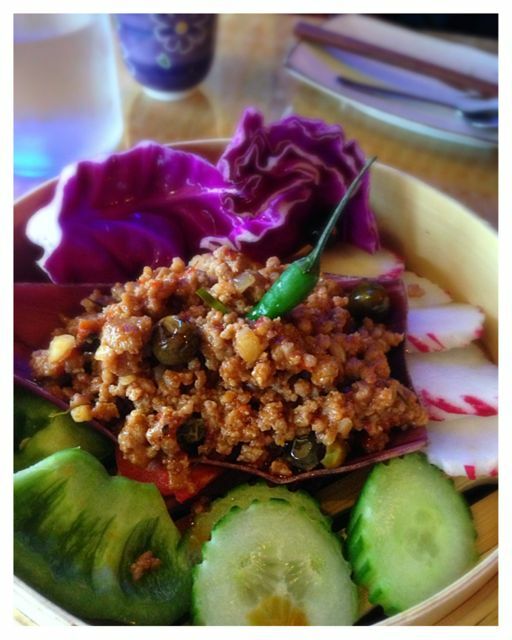 This was a ground pork, similar to a lettuce wrap, but instead you used these different veggies to dip with. A lot of flavor and you could add all kinds of spicy sauce to this. Very good! Then the Nyno’s Grilled Chicken came out. It’s a free range chicken thigh marinated in a house sauce. My favorite part of this was the dipping sauce that this was served with. Great compliment to this already flavorful dish. 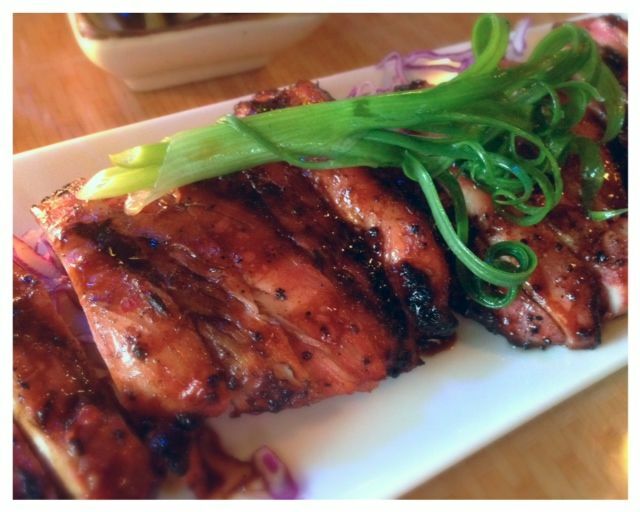 The special of the day was a Grilled Octopus that was served with a pickled papaya & spicy ginger fish sauce. At first I was leery, I had not had octopus before and they were quite long. At one point I had the tentacle hanging out of my mouth, and I got giggly, but it was really good with a smokey flavor too it. I ended up really liking it. The sauce they had for dipping had a good kick to it too. 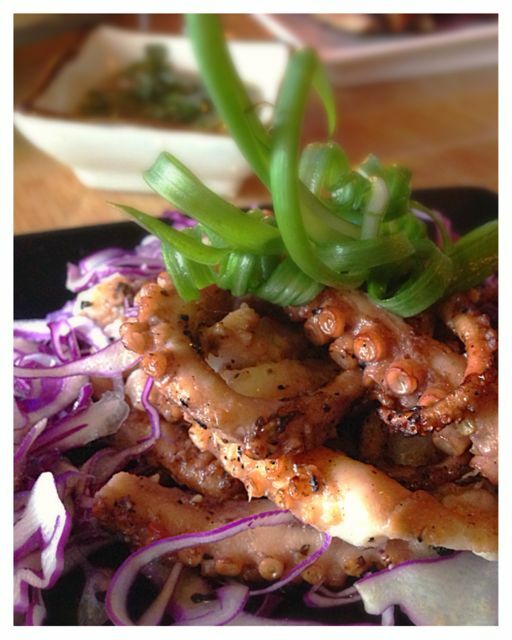 There are ways to try octopus that’s not so intimidating. 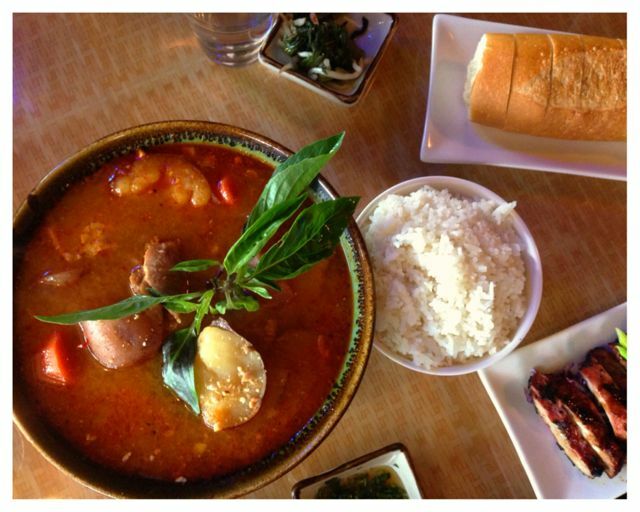 Finally we got our Khmer Red Curry soup. They said this one was good for sharing. She brought each of us a little bowl. We put in the rice and poured soup over the top. It also came with a baguette, which is good for dipping in the broth. The soup had huge chunks of potatoes, chicken and carrots. It was very mild, but you could add any of the spicy sauces you wanted. We added a spicy soy sauce that had some killer kick to it. My lips were burning, but it was a great little addition to the soup. Overall we all 3 loved this place. We loved the cute space inside this house and the music playing in the background. It was a really fun girls Eating adventure for sure. They have a special Valentines menu and if you make reservation before February 10 you can also get a free mimosa with your meal. I also saw that they will be participating in Portland Dining Month this March. 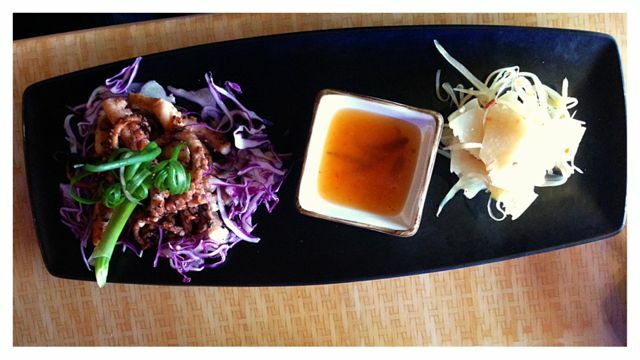 Three course prix fixe dinner for just $29. Atmosphere is very cozy inside this house, with lots of color going on. Pricing was about $8 for lunch specials and $10 if ordering off the menu. Service was incredible. She was informative, very helpful and came back often to see if we had questions. They had 3 different kinds of hot tea plus beer, wine and sake. 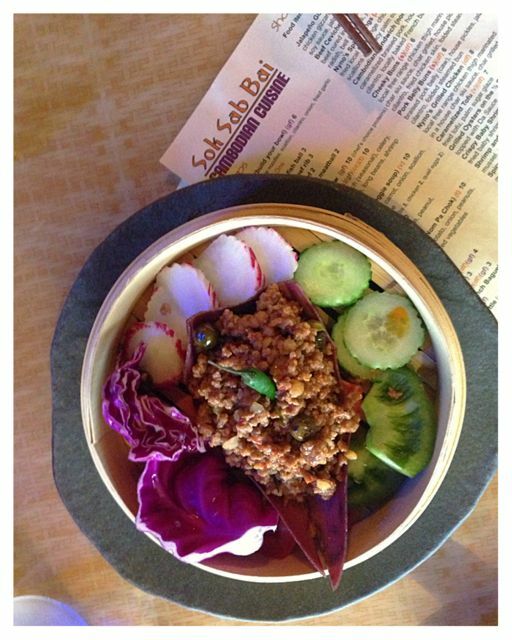 Sok Sab Bai is located just off of Clinton St. and 21st.